We’re not shy and retiring and neither is Island Cuisine. If you’re going to make the effort to exhibit at one of the biggest food shows in the country, then you want to stand out from the crowd and look your Sunday best. 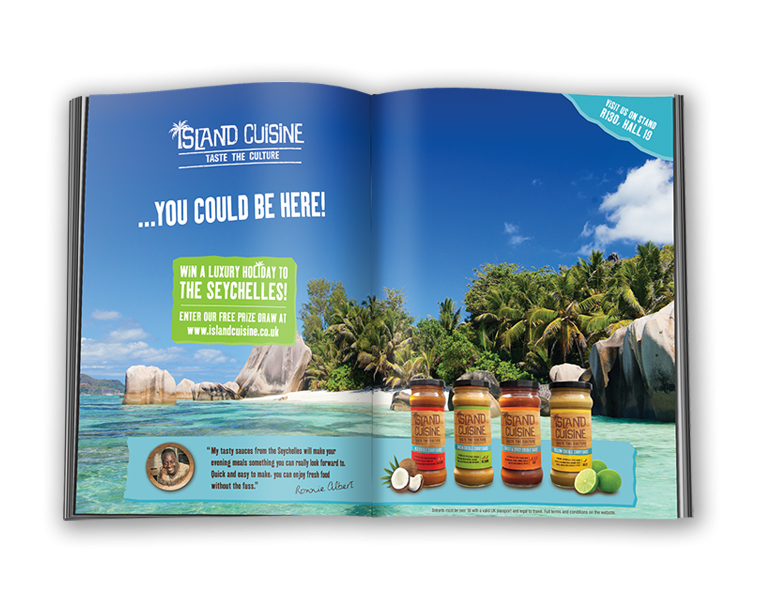 So, that’s precisely what we did when Island Cuisine made its debut at the BBC Good Food Show Winter… and the crowds flocked to the Tiki-style stand. Not content with building an all-singing, all-dancing stand, we took over the entire show. You name it, Island Cuisine was on it: from car parks to train stations, walkways to skywalks, the billboards were bursting with a taste of the exotic. What’s more, we tempted hordes of people to visit the stand by giving away a once-in-a-lifetime holiday to the Seychelles. A saucy route to success for Island Cuisine.